What’s new on Chefs’ Table? Everything! Eight new courses. Four new wine pairings. And a new format: we’ve rearranged the timing so that everyone can enjoy the menu, the classic Pullman service, and your fascinating tablemates without rushing. 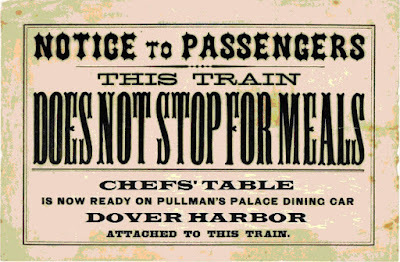 They’re all waiting for you to make your way, through Washington's Union Station, to Chefs’ Table aboard the Dover Harbor, our 90-year old luxury Pullman railcar. Join us at 7pm on Friday evening, November 18, 2016, or 7 pm on Saturday evening, November 19, 2016 when Dover Harbor celebrates the 5th anniversary edition of Chefs’ Table. Bring your appetite and a sense of culinary adventure to one of Washington’s grandest settings, Union Station. Our white jacketed stewards have set the table with fresh flowers, crisp linens and authentic Pullman dinnerware and are ready to serve a meal to remember. As always, we’ll be serving a full menu of new and favorite recipes, using local, seasonal foodstuffs and artisanal specialties. From the delightful amuse bouche to the coupe finale, there are eight new dishes and four new wines to surprise your palate. Dinner’s waiting! Please make your reservations early---this special event sells out quickly! 1. Reservations are by advance purchase only. 2. No refund or credit of purchased tickets after October 20, 2016 other than by operator's cancellation of the trip or reselling of the space. Online reservation handling fees are not refundable. 3. Passengers with special dietary requirements must notify the reservations agent in writing at least three weeks in advance of the event. 4. The Washington D.C. Chapter, NRHS makes every effort to accommodate the physically challenged; however, Dover Harbor as a historic railroad car is not wheelchair accessible. Operator requires those passengers requiring special assistance from others to travel with someone who is able to assist them. Passenger Names (Required) / DCNRHS Member No.